Protesters demonstrated at a checkpoint in Arizona to express opposition to its presence and the Border Patrol's discriminatory and racist practices. Leer el artículo en español aquí. 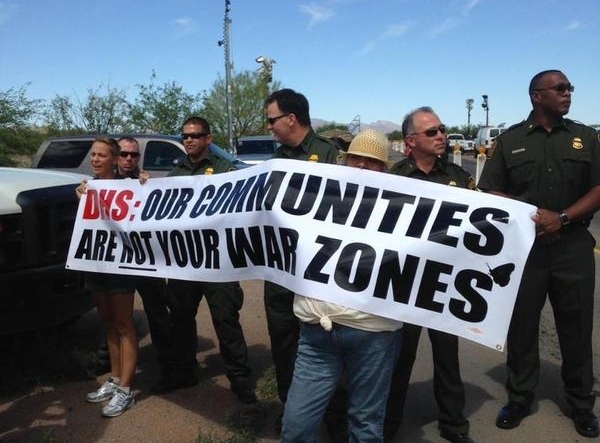 Protesters from a small Arizona town staged a demonstration at a nearby border checkpoint early on May 27 to express their opposition to its presence as well as the discriminatory and racist practices of Border Patrol. About 100 people from the town of Arivaca, Arizona made their way to the temporary Border Patrol checkpoint on Arivaca Road, about 50 miles southwest of Tucson, at around 10 a.m. on Wednesday morning. The action, organized by the group People Helping People in the Border Zone, was set to be a “community hearing and sit-in” to shut down the checkpoint along with various other checkpoints in the area near the Arizona-Mexican border. As protesters approached the checkpoint chanting “No justice, no peace! Checkpoints off our streets!,” they briefly stopped traffic before Border Patrol agents and Pima County Sheriff’s deputies shoved protesters to the side of the road. The authorities were obviously prepared for the protest as about two dozen Border Patrol agents were present at a checkpoint which usually is staffed by less than 10 agents. Once pushed off to the side by Border Patrol and police, the protesters set up a podium, along with a 12-foot paper mache effigy of Padilla, and held a “public hearing” where protesters voiced their grievances with the checkpoint. The protest lasted for about three hours in all with no arrests made. The action on Arivaca Road was just one of seven actions “calling for the demilitarization of the borderlands” over the last few days in border communities in southern Arizona, including a vigil held in Tucson on Tuesday for Jose Antonio Elena Rodriguez, an unarmed Mexican teenager shot by Border Patrol in October 2012. Although the checkpoints in Arizona were set up in 2007, they are still referred to as “temporary.” According to the American Civil Liberties Union, there are at least 11 in southern Arizona, all located about 25 to 50 miles north of the Mexican border. Border Patrol insists that these checkpoints are necessary to keeping drugs and smugglers from entering the country. The protesters claim to have shown otherwise. People Helping People in the Border Zone began monitoring Border Patrol’s actions at the checkpoint in February 2014. By October, the group released a report showing that even though the majority of vehicles stopped had white occupants, vehicles with Latino occupants were much more likely to be subject to a prolonged stop and were 26 times more likely to be asked for identification. Less than one percent of vehicles with white occupants were asked for ID. The report also showed that, of the thousands of recorded vehicle stops, none resulted in the apprehension of any criminals or contraband. Rep. Raúl M. Grijalva also visited Arivaca last year to announce that he would put together a federal congressional hearing with Department of Homeland Security officials on the negative impacts of the checkpoints. Protesters at Wednesday’s action said that the protest was also to encourage Grijalva to keep that promise. No date for the hearing has been set so far, but the protesters are determined to fight against these checkpoints in the streets, in the courts, and in government buildings until they are gone. With summer upon us, and many families on vacation — it is a GREAT idea for all Americans AGAINST Amnesty for Illegal Aliens and those who want to help STOP the never ending flow of Illegals into our country to visit any southern US state Border. Be prepared, because Obama has posted FBI and other Federal Agents at all US borders to force the US Border Patrol Agents to “stand down” and to allow all Illegals to waltz into the US ILLEGALLY. Obama is guilty of thousands, if not MILLIONS, of occurrences of aiding and abetting Illegals with ILLEGAL ENTRY into our Sovereign Nation. The southern States are SICK and TIRED of Obama’s Feds trying to carry out ILLEGAL assistance to the Non-citizens, and more states are joining in the Law Suits against Obama’s treasonous activities towards American citizens. For those Americans unaware of the constant stream of Illegals flowing into America — go check it out for yourselves!! And the anti-Amnesty posters and banners are a great idea, too!! You must see the constant law breaking smuggling operation for yourselves, to believe it!! Stop blaming the border patrol agents who are only doing their job. Blame all the illegal aliens entering this country, refusing to leave & purposely having anchor babies so they can stay here permanently.